Two veterans go to Japan to discuss the horrors of Hiroshima and Nagasaki and the urgent need for nuclear disarmament. In 2018, the average age of a Hibakusha (被爆者) — the Japanese word for a survivor of the atomic blasts at Hiroshima and Nagasaki — is eighty-one. When you speak with these survivors, you’ll most likely hear the story of what it feels like to have an atomic bomb dropped on you as a six-year-old child. Experts say six is the age kids first begin to process the concept of time. Time, the impact it has on our memories, our priorities, and our sense of responsibility for the crimes of our governments, is something I’ve been thinking about a lot. Veterans for Peace sponsored Marine Force Recon veteran Michael Hanes, our translator Rachel Clark, and myself on a goodwill trip to Japan. I’m a two-tour veteran of the US war and occupation of Afghanistan with the Seventy-Fifth Ranger Regiment. For the second year in a row, I traveled there to apologize, especially to the Hibakusha and their families. As insignificant as an apology feels seventy-two years after the bombing, it also seems like one of the most substantive things we can do to prevent such an attack from happening again. Mike and I did not give the order to drop the bombs. We did not fight as soldiers in the war that dropped those bombs. However, we were pawns of the US war machine in its latest, longest war. We both partook in wars that have killed over a million people, the majority of them civilians. We signed up to fight terrorism but soon realized we were the ones doing the terrorizing. We believe our role in the war on terror connects us in some way the 140,000 civilians who were killed within days of the atomic blasts. We believe that the deaths of so many civilians in both of these wars should never have happened. The consensus argument holds that the United States dropped those bombs on so many civilians in Hiroshima and Nagasaki to end the war and save millions of lives. This claim cannot be justified. The war in the Pacific had ended by January of 1945. The Japanese were starving and the country could no longer manufacture what it needed to continue the fight. The United States had the ultra-secret purple and red Japanese cyphers transmitting this information. High-level government officials offered surrender terms to Douglas MacArthur a full seven months prior to the bombing, terms nearly identical to those accepted in Japan Bay on September 2, 1945. This history remains largely untaught, just as the fact that the Taliban surrendered within months of the initial American invasion of Afghanistan in 2001 remains untaught — to say nothing of the lies that led us into the Iraq War. Seventy years separates World War II and the global war on terror, but the cliched line nevertheless applies to both: “truth is the first casualty of war.” This sense of being lied to, of being manipulated into participating in so much death and destruction, drove us to Japan. As we uncovered the lies of the war we fought, we soon wanted to uncover the lies of other wars, especially the “Good War,” the one that is so often used to justify others. Learning the truth can only provide so much closure; stopping the lies that lead to war became our priority. We hoped the trip would remind ourselves, those we met, and even those fighting in the United States’ endless wars around the world that ordinary Americans, Japanese, Iraqis, Afghans, North Koreans, Syrians, Nigerians, Chinese — the list of countries the United States occupies and fights is lengthy, so take your pick — have infinitely more in common with each other than with our nations’ leaders. This message seems especially relevant in President Trump’s world of nationalism, white supremacy, and nuclear threats. So often, we’re asked to remember the few times the United States has been attacked on its own soil. Never forget 9/11. Never forget Pearl Harbor. 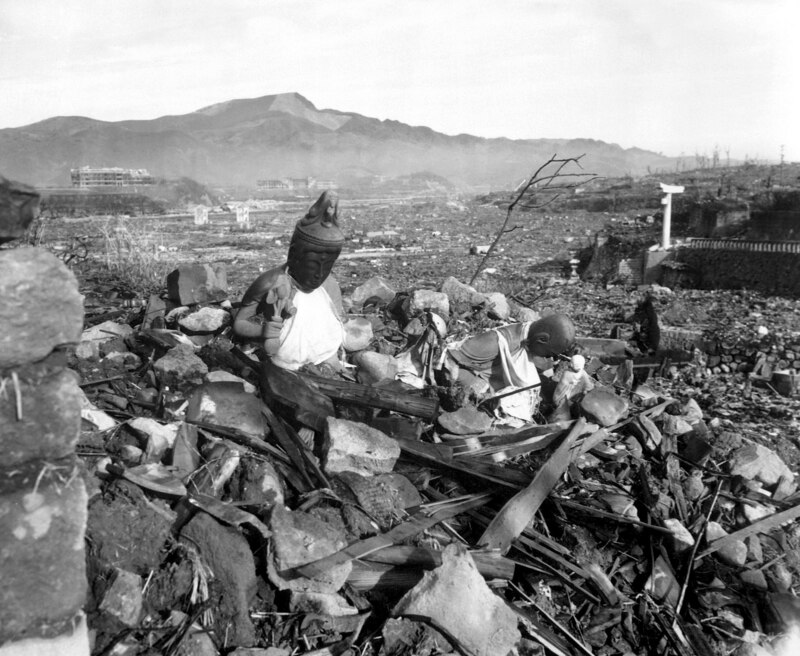 Rarely are we asked to remember when we dropped two atomic bombs on civilian populations. Maybe every American should visit Hiroshima and Nagasaki. Time makes people forget or at least take things less seriously, and that should never be the case with nuclear weapons. When the Hibakusha found out two American veterans were visiting the country on a peace tour, scores of them greeted us warmly. Seventy-two years have passed since the bombing, but many survivors still feel unheard. “This is one of the reasons your visit is important. We can never have another atomic bomb detonate, under any circumstances. Maybe, as veterans, your government will listen to you. We know American service members are treated with great respect in the United States,” Junji Maki, an eighty-six-year-old survivor of the blast told me at a cafe in Hiroshima. “Not that well, but, if you follow US sports, I can see why you’d that think that,” I replied. “We want you to take our stories back home with you. Our government does anything your government tells them to do. Our government, relative to the United States, has no real power. We feel like a colony,” another survivor and friend of Mr. Maki said. Given that the United States has as many as fifty thousand troops across scores of military bases in Japan, it was hard to disagree. We stopped at Nagasaki, where the US dropped the second atomic bomb on August 9, 1945, and spoke before Hibakusha at ground zero, where you can look up into the sky and see where the bomb detonated — something nearly impossible to imagine. A large and haunting statue of a woman, wearing a dress of roses and holding a dead child, looms over every visitor. August 9, 1945 11:02 AM — the moment the bomb detonated — is the statue’s only inscription. Some clocks around Nagasaki are frozen at 11:02 AM, regular reminders of this anniversary. We are doing something both our governments are too scared or ignorant to do, even seventy-two years after the fact. We are here to apologize to you for the dropping of the atomic bombs. There is no justification for such an act of terrorism. We are sorry. We looked up and saw tears in the eyes of people old enough to be our grandparents. We gave a short talk alongside two survivors, who accepted our apology, urged worldwide nuclear disarmament, and even apologized for what the Japanese government did to the Chinese during that time. Though not our intent, our apology seemed to trigger reflections on the Japanese government’s crimes as well. Not many people know that Nagasaki was a majority Catholic city during that time. It was a religious community, a sanctuary city for Christians who were persecuted in a largely Buddhist country, which is why the United States was so quick to bulldoze the few standing buildings immediately after the blast. They didn’t do that in Hiroshima. Most of the remaining buildings in Nagasaki were the sturdily built Catholic churches. They didn’t want Westerners to see that the Americans destroyed institutions their people belonged to. In aerial pictures from immediately after the blast, Mike and I could make out the remnants of churches. Then, Mr. Moriuchi, another survivor, handed me a postcard with an image of the severed marble head of the Virgin Mary, her eyes blown out. “Wow, horrifying,” was all I could muster, as a pit firmly lodged itself in my throat. We knew this was a different kind of bomb but we had no idea the lasting affects it would have in our lives. My mother took us into town the day after the blast. We lived about two kilometers from the epicenter. We had been starving. It had been days since we had eaten any rice, so we went into Nagasaki to pick up vegetables and to get freshwater, having no idea the water and food was contaminated. My mom, she died a few years later, probably from cancer. My aunt who was a nurse drove from the countryside to Nagasaki to help care for the wounded. She also died within years of the blast. Mike and I listened solemnly, shaking our head in disgust. I felt like I should say more, but whatever I said would have felt meaningless — possibly disrespectful — in the wake of such stories. Everyone who died within the few days of the atomic blast died a horrible painful death. Although not as many people consider that all of the Hibakusha have been plagued by a lingering thought that each year might be our last as we watched many of our friends and family die over the years. They say as many as 5,500 Hibakushas die each year from complications due to the blast. I go in for checkup twice a year. The Hibakusha have this little blue booklet that the government gives us. We have to go in for radiation poisoning checkups twice a year. But when we are diagnosed with cancer or die early deaths, the government says, “we can’t prove this cancer is from the atomic blasts.” It’s a very unjust system. I knew racism played a big part in the decision to drop the bombs. How could it not? These ceremonies, and the many reminders Mike and I received that Nagasaki was a Catholic town reflected an understanding that Americans might pay more attention to what happened if they felt like their people were slaughtered too. I remember watching my uncle die. He hadn’t eaten in days before he finally passed away. Even then, though hadn’t eaten, he started throwing up. I looked down and could see his intestines on the floor. And this was a full two years after the blast. Even though I was only eight years old at the time, I remember the smell of all that dead tissue. You don’t forget those kinds of things. And they say this was a weak bomb relative to the ones that exist today. I can only imagine the pain that would be caused by these newer bombs, whether they are drop intentionally or accidentally. This is why the only solution must be complete nuclear disarmament. Even if we avoid a direct confrontation it’s a miracle, with so many nuclear weapons in the world, that there haven’t been more accidents. After the final ceremony of the day, we walked back to the hotel, exhausted. We had many more talks and ceremonies ahead of us. Each story made our apologies feel more urgent.